Name Damian at Onomast. What does name Damian mean? Meaning, origin, translation, rating, popularity, code, gender and comments of the name Damian. The name comes from the ancient Greek word (δᾰμάζω) [damazo] - "tamed; to subordinate; hitting to death". 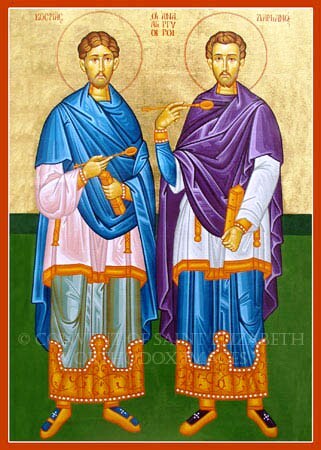 St Cosmas and Damian were brothers, born in Arabia, who had become eminent for their skill in the science of medicine. Being Christians, they were filled with the spirit of charity and never took money for their services. At Egaea in Cilicia, where they lived, they enjoyed the highest esteem of the people. When the persecution under Diocletian broke out, their very prominence rendered them marked objects of persecution. Being apprehended by order of Lysias, governor of Cilicia, they underwent various torments about the year 283. Their feast day is September 26th. They are patron Saints of pharmacists.